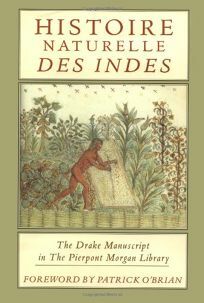 The lives of the 16th-century Caribbean's indigenous people, as well as its flora and fauna, were captured on paper by French Huguenots who perhaps sailed with Sir Francis Drake. A sumptuous facsimile edition of Histoire Naturelle des indes: The Drake Manuscript in the Pierpont Morgan Library shows us people and objects of the new world as seen, conceived of and described by their ""discoverers."" Fish with menacing teeth, land and sea birds with multicolored wings and native peoples (at work, at play and even trading with the whites) are all rendered with watercolor-like simplicity and amateurish clarity. Ruth Kraemer translates the descriptions that accompany each scene; Patrick O'Brian provides a short biography of Drake; and Verlyn Klickenborg details the manuscript's own fragmentary history and narrative.